A combination photo shows a Korean Central News Agency (KCNA) handout of Kim Jong Un released on May 10, 2016, and Donald Trump posing for a photo in New York City, U.S., May 17, 2016. Photos by Reuters. No venue or date for the meeting has been determined, but Trump's prompt acceptance set off a flurry of activity. U.S. officials on Sunday defended President Donald Trump's decision to meet with North Korean leader Kim Jong Un, saying the move was not just for show and not a gift to Pyongyang. "President Trump isn't doing this for theater. He's going to solve a problem," said Central Intelligence Agency Director Mike Pompeo on the "Fox News Sunday" program. The United States expects North Korea to halt all nuclear and missile testing in advance of any meeting, Pompeo and Treasury Secretary Steve Mnuchin said on Sunday news shows. The goal of the meeting remains denuclearization of the Korean Peninsula, something Kim has agreed to discuss, they said. Pompeo said U.S. military exercises in the region would continue in the lead-up to the talks. The Republican president agreed on Thursday to accept an invitation from the North Korean leader to meet by May after months of escalating tensions over Pyongyang's advancing nuclear and missile programs. Trump would become the first sitting U.S. president to meet with a leader of the reclusive country. The two men would face each other after a public volley of insults, with Trump calling Kim "Little Rocket Man" and Kim referring to Trump as a "dotard." The South Korean officials who carried Kim's invitation to Washington will split up to visit the leaders of China and Japan this week to update them on the talks, a South Korean presidential official said on Sunday. China, North Korea's main ally, has encouraged dialogue over Pyongyang's nuclear program, and its state media on Saturday credited Beijing for helping ease tensions. "China continues to be helpful!" Trump tweeted on Saturday. North Korea's leaders have sought a face-to-face meeting with a U.S. president for decades, but have been rebuffed over human rights concerns as well as the nuclear ambitions. U.S. student Otto Warmbier died last summer shortly after his release from a 17-month detention. Three Americans remain detained in North Korea. 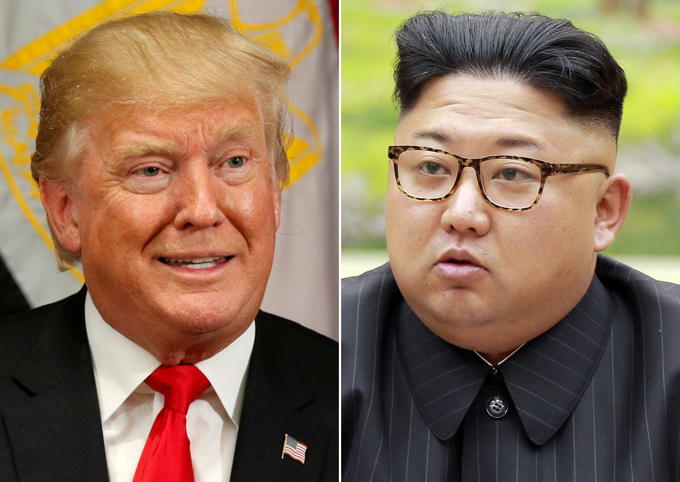 Many Democrats as well as Trump's fellow Republicans said the United States should have demanded concessions before granting North Korea a meeting. "Before they get that kind of prize, we should insist that they make some real changes, verifiable changes to their programs," Democratic U.S. Senator Elizabeth Warren said on NBC's "Meet the Press." Warren said she was worried the North would "take advantage" of Trump. Pompeo and Mnuchin said the United States would make no concessions and would keep the pressure on North Korea by maintaining economic sanctions and a strong U.S. defense posture before the meeting. They also dismissed criticism that Trump's decision to meet elevated the North Korean leader on an international stage. "This administration has its eyes wide open, and the whole time this conversation takes place the pressure will continue to mount on North Korea," Pompeo said on CBS' "Face the Nation." The United States slapped sanctions on individuals and groups in North Korea in October over "flagrant" human rights abuses and added sanctions in February. Six Republican senators last week sent a letter asking Trump to share his plan to keep up pressure on "this heinous regime." One of them, Republican Cory Gardner, told CBS on Sunday it was important to see concrete steps from North Korea before the meeting. "After this meeting, there's going to be very little left of that diplomatic runway," he said. Mnuchin addressed criticism that Trump has not used more diplomacy to contain Pyongyang's nuclear ambitions. "So the president is going to sit down and see if he can cut a deal," he said on NBC's "Meet the Press." The prospect of doing something no American president has done - especially on such an intractable geopolitical problem - was irresistible to Trump, Eurasia Group President Ian Bremmer said on CNN's "Fareed Zakaria GPS." "So it's the first. It's incredible television. Clearly Trump wants to make this happen," Bremmer said. "But that doesn't mean it's going to happen."